Credits for "If the Stick Dances"
The bow maker was Gary Leahy. Additional sounds were provided by Chris Watson and John "Bob" Brennan. For a full listing of all the music used in the programme, please see The Lyric Feature webpage. 'If the Stick Dances', a radio documentary by Éamon Little. 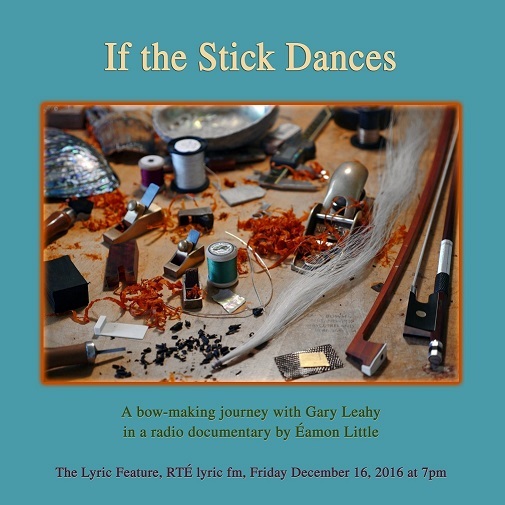 If the Stick Dances (billed in some publications under its working title, Take a Bow) will air on RTÉ Lyric fm this coming Friday, December 16th at 7pm (Irish time). The following are links to some of the people involved in or associated with the documentary..